This is one of my favorite personal cuts from J.D. and Sons. It is a rough mix from the studio session, so there are volume spikes. I just dig the jam. From the CD Family Values, the first CD I played on with the group. In the spring of 2002, I received a phone call from Randy Hetherington of Midtown Recording Studios in Erie, Pennsylvania. He asked me to participate in a completely spontaneous recording session with players I had never met. I of course immediately said, "Sure!". Having played and recorded in free improvisation groups before, I looked forward to flexing those chops again. The initial session consisted of Tim Smith (guitar), Jim Nordstrum (bass), J.D. 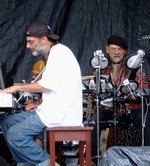 Hopkins (electronic drums), and Rickie Hopkins (drums). Having been invited as a keyboard player, I jumped into the session on an old Fender Rhodes. This first jam became track 4 of Family Values, Frank Enters. I played two more evenings with the group on keys, guitar and guitar synth, with Mike Ohm (guitar, guitar synth), Scott Cravener (guitar), Kenny Cornelius (bass), and Jayson Hopkins (electronic drums) all being present at one time or another. Along with other musicians on other tracks, this music all ended up on Family Values. Over the next few months, J.D. invited me to several more of these sessions, including a few overdub sessions, where J.D., Jayson and Rickie had pre-recorded drum and percussion tracks. Two of these cuts became tracks 1 and 7 of Primate Gestures, Prelude and The Mind of Frank (thanks, J.D.). All of the other sessions were collective jazz improvisation, bringing back Mike Ohm, Randy Hetherington and J.D., Jayson and Rickie. 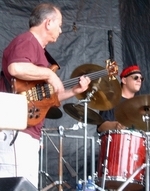 Keith Homerski (electronic drums) joined the crew for a cut, Jeremy Quezada (guitar) for two cuts, and the album features four different bass players. Tony Stefanelli of Cat's A Bear, Mike Chin of One World Tribe, David Blaetz of Potato Battery, and Ralph Reitinger of Mambo all contribute to the collective, and each one brought a unique sound and feel to the group. By the time January 2003 rolled around (or in Erie, stormed in via icy blasts), the group was gelling, and cutting more tracks at Midtown. Mike, Dave, Tony, Kenny, Randy, Scott, J.D., Jayson, Rickie and myself are joined by Potato Battery guitarist Sheldon Peterson on the fifteen-track double CD Music From Another Planet. The group began playing live gigs in 2003, first at Forward Hall, then the Roadhouse Theatre, and at the Frontier Park Jazz and Blues Festival, held very summer in Erie, PA. Early that summer, J.D. and the Sons of Rhythm released Quantum Events, featuring 11 cuts of very intense jamming. 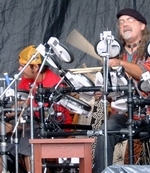 Joining the ensemble for the first time were Mambo percussionist Joel Polacci, Wierdo Theatre's guitarist Joe Popp, and Ambitious Noise bassist Mark Chulick. Joel and Joe stayed in the mix for the next two CDs as well. In 2004, J.D. and the Sons of Rhythm recorded material for these two albums, Smoke Shadows and Imagination Doctors. Smoke Shadows portrays the open, spontaneous way that the group plays live, with full, epic jams featuring grooves, meshed layers and solos. The bulk of this CD, and the 45 minute A.D.D. jam from Imagination Doctors are from a series of sessions done in delightful sweltering heat, at a very intense time locally and globally. This intensity plays out in the music as ideas are 'discussed' via instrument. Imagination Doctors side 1 builds on the overdub concept begun on Primate Gestures, with drum tracks laid down first or with the first pass of melodic and harmonic instruments. One thing that began here is the interactive overdub. Since more than one person is overdubbing on a pass, and the dubs are improvised, there is still a great deal of spontaneity using this typically more commercial technique. Ten cuts make up the first side, all the result of some form of overdubbing. In addition to the A.D.D. cut, side two contains two more typical J.D. and Sons jams, the first a more rocked-out jam and the last a 'talking-guitar' sound theme, both with Tony on bass. In February of 2004, J.D. and the Sons of Rhythm recorded a live performance at Forward Hall, which is directly attached to Midtown Recording Studio's digital recording facility. Live at Forward Hall was released in the fall, and showcases the ensemble's ability to play this music consistently, no easy task in collective improvisation. Bassists Tony, David, Kenny and Ralph, guitarists Mike, Sheldon and Joe, and myself on guitar and keyboards joined drummers Rickie, Jayson and J.D., Joel and for one cut, guest drummer Allen Chaffee. In the early spring of 2005, two more double-disc CDs brought the total to 9. Beyond Attention and Crossing Oceans of Time were released as a set, with original artwork from J.D. and the same group of players on both discs. These two discs add new players, new dimensions and new techniques to this innovative project. Phil Papotnik (sax) of Cat's A Bear, Chad Garrison (tpt) and Joe Frisina (guitar) join bassists Kenny, Tony and David, guitarists Mike and Sheldon, percussionists J.D., Rickie and Jayson and myself, playing guitar and guitar-synth, keyboards, and on Crossing Oceans of Time even a track of bass (Headhunter). As well as the addition of live horns, these albums combine live jams with layered overdubs. These cuts were then distributed among the CDs with some edits using direct transitions between songs. The result is a storytelling effect that creates true albums instead of song collections, similar to the John McLaughlin album Extrapolation (a classic!). Since January of 2005, studio sessions with Cat's A Bear members and One World Tribe members have taken place, and some incredible things have come about in these sessions, some of which is contained on double CDs ten (Moving Through The Elements) and eleven (Astral Worlds). More recently, in the late summer of 2006, disc 12 (Near Journey's End) was released. This CD contains 19 tracks, and commemorates the passing of artist James Hall, who did the cover art, and Mike Smith, jazz drummer. Both died in the spring of '06, during the release process for this CD, and were close friends of J.D.'s. Life, Liberty and Jazz Rock Fusion! Copyright © 2002 - 2008 by Frank Singer and Naked Kitty Productions. All rights reserved.